Immersed in a quiet and safe area, the 3-star Hotel Acacia in Villamarina di Cesenatico features a large swimming pool with solarium, jacuzzi, sauna, gym and playground. Admits small animals, which have free access to the beah affiliated with the hotel. 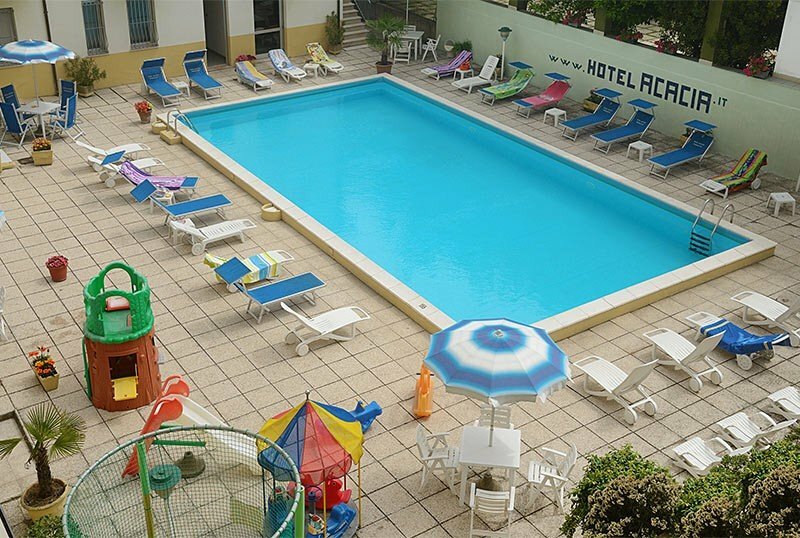 The Acacia Hotel is located in Villamarina di Cesenatico, a few steps from the sea, in a quiet green area near the Levante Park, ideal for walks and sporting activities. From the hotel it is easy to reach the historic center of Cesenatico and the canal harbor, a lively area full of bars and restaurants. With a short walk you can also reach the center of Gatteo Mare and its station. All rooms are equipped with air conditioning, safe, satellite TV and digital terrestrial, WI-FI connection, direct dial telephone, mini bar on request and private bathroom with shower (box or curtain) and hairdryer. Some rooms have sea views. The hotel has a swimming pool with a large solarium area, hydromassage, garden, open-air porch, sauna, gym, specific services for cyclists, lift, TV room, living room, reading room with newspapers available, free use of bicycles. Theme nights with live music and a welcome drink are organized. PARKING : uncovered and free, available for everyone. CONVENTIONS: beach, amusement parks, waterslide, INAIL / INPS, organized excursions. PETS: pets are allowed free of charge, which find a customized welcome even on the beach. LUNCH AND DINNER: 3 or more choices menu, vegetable buffet, pasta and homemade desserts. In the hotel: playground area adjacent to the pool (slides, small rides, swings and elastic net), indoor playground area, strollers, entertainment, baby / mini / junior club, baby sitter, pediatric counseling. In the room: cot, side rails, bottle warmer and night light. At meals: seats at the table, baby menu and pappe with flexible hours, afternoon snack, bottle warmer. Acacia is a bike hotel and provides specific services and packages for cyclists: bicycle storage, indoor area for maintenance, medical and physiotherapy assistance, dedicated kitchen, laundry for technical clothing, bicycle washing area, supply of technical equipment, sauna and gym, itineraries and guides. Swimming pool of 100 square meters with variable heights (from 135 to 155 cm) with heated water, equipped solarium area and WI-FI areas. In addition to the entertainment service, the staff organizes cocktails on the poolside. The hotel has an agreement with the baths: Bruno (gym, beach volley, five-a-side football, tennis, bowls, catering, refreshment), Corallo (dog area, TV area, children's playground area and restaurant), Internazionale Cesenatico (bar -ristoration, aquagym, spinning, tV 42 ", hot shower, live entertainment, mini / baby club, beach volley, beach tennis, ping pong, bocce court, pedal boats, evening parties). The prices listed are per person per day for a minimum stay of 3 nights. Prices not valid on Easter holiday and long weekends. Discounts for children in low season!